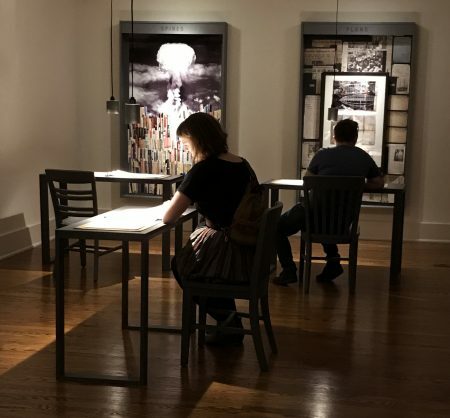 Nuclear Fallout: The Bomb in Three Archives at Antioch College’s Herndon Gallery investigates historical documentation and mines personal accounts to challenge cavalier attitudes and awaken concern about nuclear war. It does this through highly original re-imaginings of how information itself can be communicated, and how memories of the 1945 atomic bombing of Hiroshima and Nagasaki persist in thought and matter. The show features work by artists Migiwa Orimo and Kei Ito. It was developed by curator Jennifer Wenker in response to the 2018 Cincinnati Fotofocus Biennial theme Open Archive. The Herndon Gallery has been transformed for this show into a theatrical space, a somber one. It’s dark, with the exception of two strong spot lights, five subdued reading lights, each hanging by a cord, and a bluish video monitor. It’s silent, and the first, unavoidable piece one encounters when entering through the gallery’s double doors is a long, deep shadow of an X stretching across the floor. 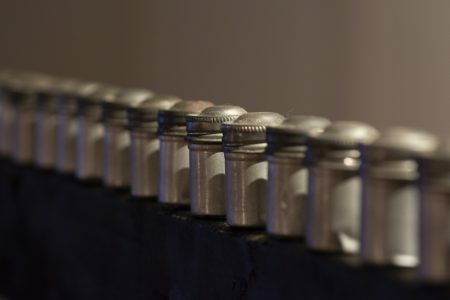 This is Ito’s piece, Ash Lexicon: Silverplate. The X is formed by two pieces of long, narrow wooden beams suspended from the ceiling at transverse angles. Hanging independent of each other, the position of the spotlight joins their shadows seamlessly. The beams are offset, one at eye level and one slightly higher, but low enough to make visible the small objects they hold. Each beam carries a row of contiguous aluminum 35 mm film canisters, 108 in total, the kind that would have been in use during WWII. Inside the canisters is ash (we are told, we can’t see it) from an incinerated Japanese dictionary. A replica of a prized volume owned by Ito’s grandfather, an author and atomic bomb survivor, the original was destroyed during the blast in Hiroshima. His grandfather later wrote about how the blast burned the pages black but charred the ink so it was white, utterly reversing the image impressed on the page. If the aluminum film canisters locate us in a period of time, the iconic X locates us at a place, the site of detonation. Where it happened and wherever it may yet happen, the shadow, the specter of its destruction is intangible but present, looming. The dictionary speaks to what is dislocated, lost, evaporated – a complete reversal of culture, language, history, humanity in the space of a flash, an instant, the opening and closing of a shutter, the pressing of a button. Its ash is an archive altered and collected in a form we read now by matter rather than words. Ito’s work draws directly from the archive of his own family history, using his photography both as a physical and conceptual tool to document and to render the effect of nuclear war on him. In a nearby grid of 108 chromogenic color prints from Ito’s Sungazing series, begun in 2015, he uses his own breath as a marker of time and a measurement of impact. 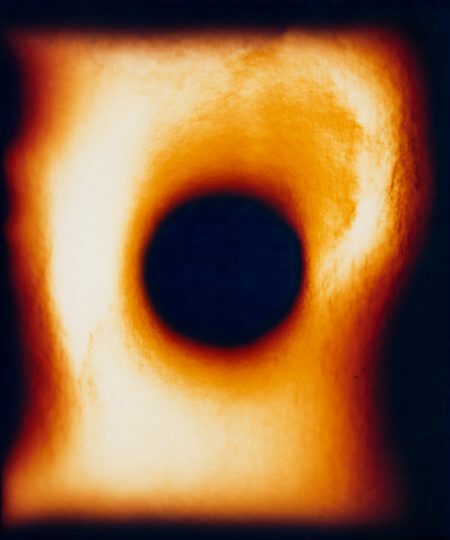 In remembrance of his grandfather telling him the bomb looked like hundreds of suns lighting up the sky, Ito created the photographs, made with a small aperture that allowed the sun’s radiation to directly expose the photo paper in the length of a single breath. 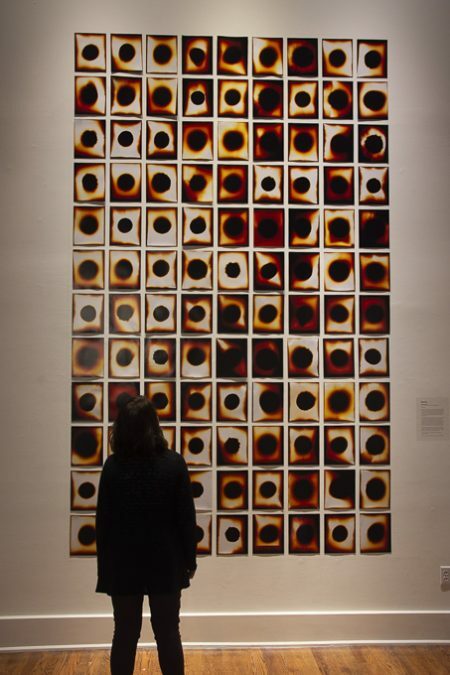 The effect is a black circle burned into the center of each sheet of paper, a negative image of the story’s hundred suns. The number 108, frequently used in Ito’s work, is ritually significant in Japanese Buddhism to aid in purification of the soul and the riddance of evil. The video Thirst, an ode to radiation victims who drowned trying to satisfy their unquenchable thirst, underpins aesthetic elegance with shocking narrative. Each of Ito’s compelling visual pieces gain another, more distressing layer of meaning with an explanation of the significance of the material and/or process, creating a tension between beauty and horror. 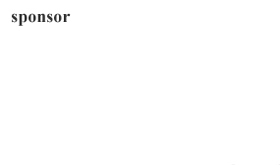 Orimo’s installation Proofs of Burden operates differently. Slyly understated, the work presents a progression of intimate, carefully honed details, each within a specific setting that invites the viewer into a process of looking, comparing, and connecting. This process facilitates the revelation of fragments assembling into something greater, a complex vision of facts and truths interwoven with doubt, contradiction and complicity. Proofs of Burden, Migiwa Orimo. 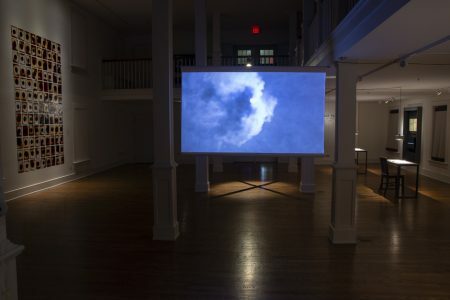 Orimo developed her installation in the context of two local archives of the atomic bomb, the Hiroshima and Nagasaki Memorial Collection of the Peace Resource Center at Wilmington College, and the National Museum of the U.S. Air Force (which features the B-29 bomber that dropped the “Fat Man” atomic bomb on Nagasaki) and also the US National Archives’ declassified primary documents and first-hand accounts of victims and survivors. For Proofs of Burden she constructed her own “archive” by building five individual cabinets that display reconfigured artifacts culled from the original archives. Each cabinet is hung across from its own corresponding table, chair, and reading light. 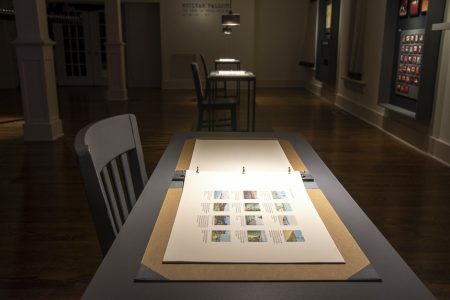 On each table is a slim volume covered in gray linen, a kind of scrapbook album, that lays open in invitation to the viewer to sit and examine. Each volume is titled “Errata”, a term used in publishing that indicates a separate, corrective text to the original publication. 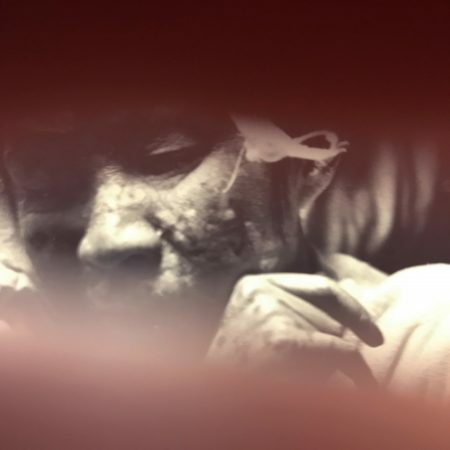 In the cabinet labeled “Rosy Invisible”, Orimo re-photographed a series of archival slides documenting a woman with radiation burns by obscuring the edges with a cupped hand to isolate her scarred face. The resulting group of images have focused centers with blurred pink borders where the camera was unable to focus on Orimo’s hand. We see the pink hue bleeding into the sharp scar tissue, the part of the image that Orimo won’t block out, won’t let us as viewers avoid. The errata book contains Orimo’s research on the woman, who she learned was a poet. Several of her poems are presented there as a counterpoint to the photographic depiction of her as an anonymous, mute victim. The cabinet “Souvenirs” contains cheerful objects and postcards created by Orimo to further underscore the nostalgia with the past is colored or obscured. 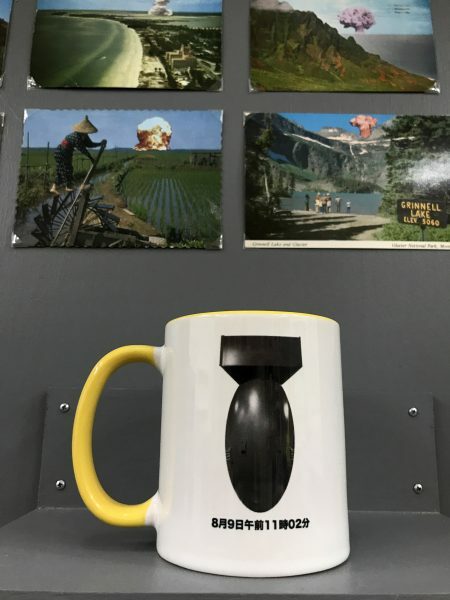 Coffee mugs decorated with bomb imagery and knick-knack sized plastic bomb sculptures accompany an array of vintage 1950’s era technicolor vacation postcards. The postcards have been modified by Orimo to include a collaged-on image of a mushroom cloud somewhere in the background. The collection of “souvenirs” also includes one unmodified artifact from the original archives: a replica sheet of US postage stamps, ultimately never released, depicting a stylized mushroom cloud, designed and produced to honor the 50th anniversary of the end of WWII in 1995. The errata book contains copies of the reverse sides of the postcards, handwritten documents of a concurrent time but a completely different reality. Orimo’s work focuses on language and its “slippage”. She calls into question what we understand through personal, cultural or official communication, and what meaning remains when that exchange fails, by intent or accident. In Proofs of Burden she creates a space where multiple sources of information, from US military lists of bomb damage to graphic novels created by survivors, intersect to complicate and ultimately undermine conventionally understood narratives about the bomb and its legacy. The term “slow art” has been adapted for the art world in response to the way that the term “slow food” has become a signifier for not just the product but the process, and even ethics with which it is considered, grown, harvested, prepared, transported, served, and consumed. This exhibition reminds me of how satisfying it is to experience art made in this way, even if the topic is a difficult one. Both of these artists have created work that is built with great care and responsibility to its subject. It takes time to fully absorb and appreciate. The reward for taking that time is the development of deeper awareness of another’s experience, and an expansion of capacity for imagination. Migiwa Orimo, born and raised in Tokyo, is an installation artist and longtime resident of Yellow Springs, OH. She is a four-time recipient of the Ohio Arts Council Individual Artist Grant and exhibits nationally. Kei Ito is a photographer and installation artist who has gained national recognition for his work relating to the atomic bomb. In 2016, he received Cincinnati’s Manifest Gallery “One” award, which selects a single work as the best piece of the year. 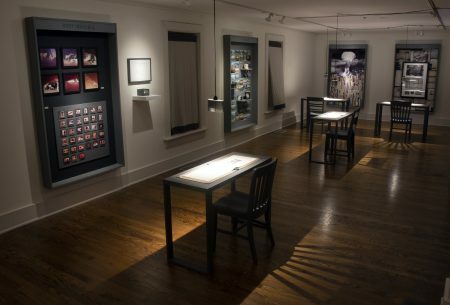 The exhibition Nuclear Fallout: The Bomb in Three Archives at Antioch College’s Herndon Gallery closes on December 7th, Pearl Harbor Day, with a talk by Tanya Maus, Ph.D., Director of the Peace Resource Center at Wilmington College. Very good reporting on a perfectly marvelous show. Bravo! Migiwa with big thanks to Dennie Eagleson for the documentation. I saw your show, again with awe… yet another time through this medium. Thank you. A very generous and thoughtful review of a terrific show. A nice juxtaposition of two distinctly different modes of work. One based on personal history and a ritualized production, the other on research and ingenious collecting and collating of material. Wonderful review, solid memorable show. Very good photo coverage in review. Deeply thoughtful exhibition and review, reflecting poetic insight–not didactic lessons–drawn from one of the great horrors of the 20th century. This itself is a lesson, and suggests a sense of humanity based on reflection and hope. Thanks to all.